According to India Times, the technology needed for Indian officials to spy on BlackBerry Messenger users in the country is almost ready to be turned on. 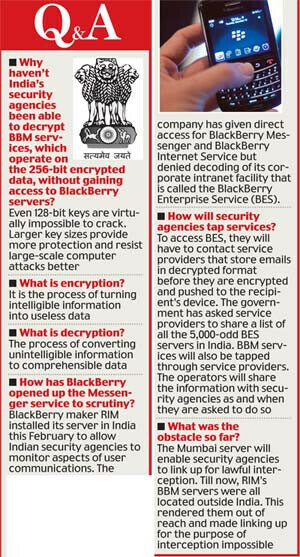 A wiretap warrant from the Union Home Ministry would still be required, but the technology will allow Indian officials to catch unencrypted BBM messages before they go through the BlackBerry Internet Service when it becomes too late to decipher. The BlackBerry Enterprise Servers were not a concern for the police in the country since they usually handle conversations between employees. As we told you back in January, RIM was concerned for the security of its corporate users in the country. On the other hand, the officials in the country are worried that the 256-bit encrypted data used for BBM messages can be used by terrorists. 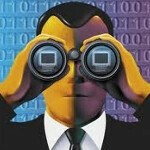 At first, RIM had objected to the "spying" since Indian officials, without a server of their own, would have had to spy on RIM's Canadian servers. But a RIM server was added in Mumbai in February, and while BBM messages usually are not encrypted until the ending destination of a message (RIM never gets the messages delivered to the company), the Indian government is being allowed access to whatever messages it can read, with the wiretap warrant of course. The next stop for the Department of Telecommunications is Nokia's push email system which is similar to the BlackBerry process. Indian officials have no fear of communications made over iOS or Android models because they use standard security and can be more easily intercepted. Thought PA was off for the holiday, guess not. by the time india govt starts monitoring there won't be not many remainin to be monitored, seeing how RIM performs these days. Wow! Seems like bureaucratic red tape at its finest. This has been going on since 2010?!! Rim seems to take its' own privacy over national security. By the time Indian government have access to it, RIM the sinking ship would have cease to exist. Indian govt. may have some catching up to do - iMessage traffic is encrypted at the device before being sent, if memory serves. Apple may have a trapdoor to enable decryption of iMessage traffic, but where time is of the essence, contacting Cupertino may not be practical. I think India trying to steal out everyone Secret, and its most upgraded and common technology Every where, Government and Agencies most Probably rely on these Blackberry Spy App in order to disclose anyone secret.